Our Auto Set Motors that Defeat Daylight Savings adjustments are simply amazing! Even without a radio or computer signal, they will automatically adjust in the Spring and Fall to the correct time. This is done by having an internal pre-programmed chip that stores the correct time for the time changes. In the Fall the movement will stop for an hour and in the Spring it will “fast forward” for one hour. Even better, our Daylight Saving Motors are high torque movements, capable of operating clock hands up to 18”. 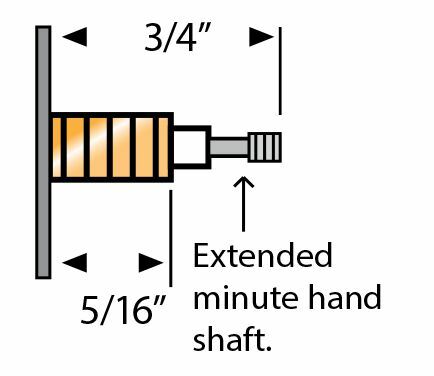 The USA models have the American “I” shaft and include a FREE choice of hour and minute hands under 5”. Will update at both DST changes only in the USA. Pre programmed to update for Daylight Savings until the Year 2099!